Hanoi (VNA) – A meeting was held in Hanoi on August 2 to launch Vietnam’s national action plan for the reduction of antimicrobial use and antimicrobial resistance in livestock production and aquaculture in the 2017-2020 period. Funded by the US Agency for International Development (USAID), the action plan was built with technical support of the UN Food and Agriculture Organisation (FAO). It aims to review, amend and implement regulations and policies relating to antimicrobial resistance and antimicrobial use in animal husbandry and aquaculture, while raising the awareness of antimicrobial use and the risk of antimicrobial resistance infections among farmers, workers in the agricultural and food industries, and consumers. The action plan looks to promote good practices in medical examination and treatment, animal feed production, animal farming, and aquaculture. It will also supervise antimicrobial use, antibiotic residues, and antimicrobial resistance in livestock production and aquaculture. Cooperation in antimicrobial resistance management among sectors is also set to be facilitated under the national action plan. Deputy Minister of Agriculture and Rural Development Vu Van Tam said the use of antibiotics in livestock production in Vietnam hasn’t been strictly monitored, especially in pig and poultry farming. The inappropriate use of antibiotics will lead to antibiotic resistance and residues in food. 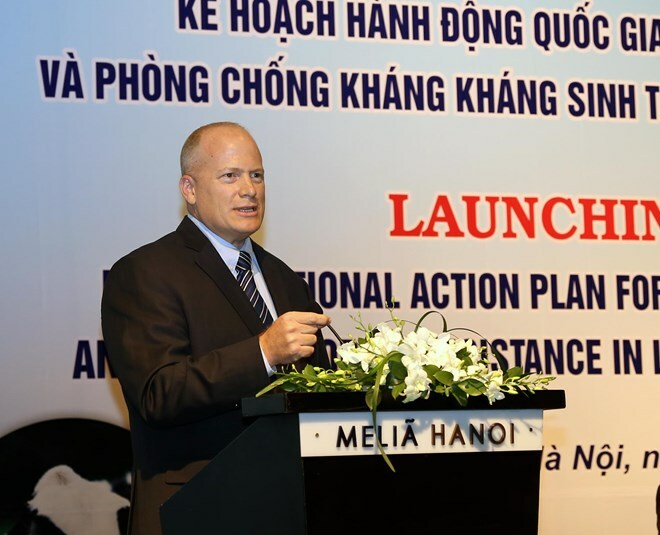 USAID Vietnam Deputy Mission Director Craig Hart said the launch of the action plan is a very important step, but its success depends on the compliance with and enforcement of law when necessary. FAO representative in Vietnam Jong-ha Bae said antimicrobial resistance threatens the health and livelihoods of Vietnamese people, as well as the sustainability of agriculture, food production and the environment.